Since the Dialing Rule Optimizer was extended to create a total end-to-end Powershell script for North American users, it was relatively trivial to add similar functionality for other countries. 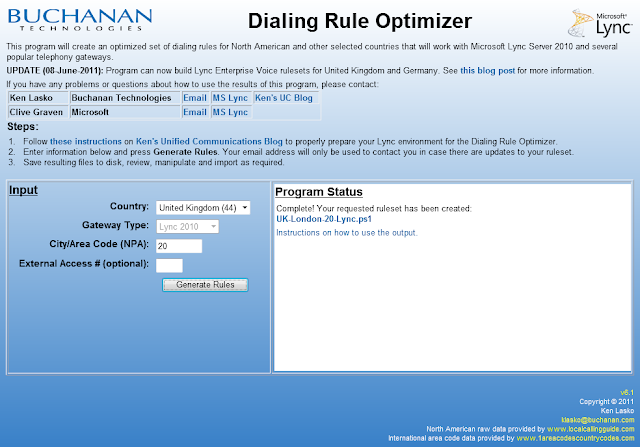 Now, the Dialing Rule Optimizer can provide a Powershell script that will create all the rules necessary for an Enterprise Voice deployment for users in Australia, Germany, Netherlands, Norway, Sweden and the United Kingdom with more on the way. I've even attempted to convert English to German (thanks to Google Translate...so any blame on translation accuracy can be pushed that way). Because of those assumptions, I didn't have to perform any of the complex calculations necessary for North American numbers. Since the dialing rules aren't expected to change over time, you can't enter an email address for non-North American rule updates. Also, since this is designed as a Lync-only feature, you can't (nor should you need to) create rulesets for the Dialogic or Audiocodes gateways. Please let me know if my assumptions are incorrect, or if you can offer corrections to my German translations.
" number normalization for "
"Enter the Site ID to apply the dialing rules for "
"Multiple application pools found. Please select the application pool to apply call block/park"
"No default PSTN gateway found. You must define a PSTN gateway in your topology and assign it to this site before running this script." "The number you have dialed is prohibited due to corporate policy. If you need to reach this number, please notify your manager." Thanks Ken, I've looked forward to seeing dialing rules for other countries. Would it be possible for you to add Sweden to the list? It's the same rules as you used for UK. An area code starts with 0 followed by one, two or three numbers ie 08-xxxxxxxx, 021-xxxxxxx or 0220-xxxxx. Local numbers can be 5-8 digits. Thanks for the details Markus. That's exactly the sort of info I need. "Ange platsens ID att tillämpa dirigerinsregler för minsta kostnad"
"Ingen standard PSTN-gateway hittades. Det rekommenderas starkt att man definierar en PSTN gateway i topologin och kopplar den till denna plats innan du kör det här programmet. Ändringarna kan fortsätta, men du måste då manuellt tilldela de linjer och dirigeringsregler när PSTN-gateway har tilldelats platsen. " I've not been able to locate any better document/list with all Area Codes and Cities than the one I liked to in my post. Thought you might like the full set of matches and translations for the UK phone system. These conform to the current standards from OfCom (government dept responsible for telecoms). Thanks for the great work on your blog. Thanks for the update, Mike. I've updated the rules to include the additions. One question, I don't understand the UK-Service-Exchange-Service rule. Can you give me some examples? These allow POTS lines to be diverted at the exchange before getting anywhere near the customer premises. Lots of SMEs in the UK use these features (they're also extemely useful if you have a trunk line playing silly beggers). It will take any combination of numbers or * or # as long as it starts with * or # and ends with #. The Norwegian country code is +47. most siptrunk providers accepts the fully e.164 numbering plan, and translations are not needed. Other PSTN providers (PRIs and BRIs) Expects to reicive the accurate number for the Norwegian numberplan, and 00 as a toll alert for all international calls. There are no difference in local or long distance calls in Norway, but special charges apply to certain number ranges (see list). Customers often seperate Mobile numbers and Premium services into different PSTN usages, to keep costs down. Emergency numbers are sent out the same gateway as any othe call. 120 - 179 ("Service numbers") local charges. Number ranges 2x, 3x, 5x (except 58, 59), 6, 7, 85x terminate in fixed and/or IP telephony networks. Translations (as best as I could do, as it is a bit difficult to get the correct wording without the entire context). "Kunne ikke finne angitte lokasjons prefix for "
" nummer normalisering for "
"Legg inn lokasjons navnet for lavest kost ruting for "
"Kunne ikke finne en standard PSTN gateway. Det er anbefalt å definere en PSTN gateway i topologien din før du kjører dette programmet. Du kan fortsette uten en Gateway, men du må senere legge rutene og nummermanipuleringen til gatewayene dine manuelt. Etter at du har lagt dem til i topologien." would it be possible to add a danish version? Denmark generally uses an eight digit closed telephone numbering plan with no area codes. "Kunne ikke finde angivne lokations prefix for "
"Indtast lokations navnet for billigste rutning for "
"Kunne ikke finde en standard PSTN-gateway. Det anbefales at definerer en PSTN gateway i topologien før du kører dette program. Du kan fortsætte uden en gateway, men du er nødt til senere tilføje ruter og nummer manipulation til gateways når du har tilføjet dem til topologien." It's done. Check it out and let me know how it works. Ken just wanted to say thanks this tool is fantastic, however however i have a question how does your tool handle area codes that for local calls you don't need the +1 and for other calls to the same area code they require +1. I'm also running into issues with regards to missed calls or voicemails that show with a +1 so when you click the link in the mail it does not require it for that type of local call. Not sure i've made any sense. But let me know if you need further info. The main purpose of the Lync Optimizer is to deal with exactly the scenario that you describe. It builds the necessary translation rules to strip the +1 for local calls within the same area codes, but to leave the 1 for long distance calls within the same area code. The key is that EVERYTHING needs to normalize to full 11-digits, including your numbers in AD and your dialing rule groups in Exchange UM. Read through my posts on Enterprise Voice Best Practices for more info. It's likely not in the right format for some of the data you need. (Disclaimer: I'm one of the editors of that metadata file). * 5-digit numbers used in the twelve 5-digit 01xxxx area codes. * 8-digit numbers used in the five 2-digit 02x area codes. UK area codes are not exclusively 4 digits long. Area codes can be 2, 3, 4, or 5 digits long. Local numbers can be 8, 7, 6, 5 or 4 digits long, for a total number length of (mostly) 10 or (occasionally) 9 digits. Thank you very much for the information on that XML file. Its very interesting, and I will see about incorporating it into my program. As for the UK patterns, I'm working with Ian Galpin to correct the deficiencies in the rules. Having never been to the UK, its a bit tricky to find the right info for UK dialing rules (until now).